Published March 13, 2014 By Leisa Good This post may contain affiliate links. Regardless, I only recommend sites I've researched and/or used and trust. Are you someone who enjoys forum participation? Do you enjoy experimenting with social media? Is protecting the clients brand something you would like to do? Then signing up for the ICUC Home Moderation Expert might be a good work-at-home (WAH) option for you. ICUC may occasionally have openings for people living outside the United States. Founded in 2002, ICUC Moderation Services Inc. is a Canadian firm that focuses on ensuring safe brand protection. Accomplished through a team of skilled moderators, many of whom work from home, the clients' information and copyrighted content is monitored and protected. ICUC offers these services in over 10 major languages to clients around the world on a 24/7 basis. How Does ICUC Help Their Clients? What Does the ICUC Home Moderation Expert Do? With clients that include Chevron, Starbucks, Virgin Mobile, and Pro-Bass Fishing, the Home Moderation Expert is responsible for helping promote the client's brand from a social networking standpoint. The Home Moderation Expert is also responsible for securing online promotions, which many times are done through social media or social media ads. What Does the ICUC Home Moderation Expert Job Entail? The home moderation job includes moderating forums of all types around the clock including weekends and holidays. Client categories may include government, private industry, entertainment, media,and non-profit. What Are the Hours at ICUC? Employees work 8 hour shifts based in Central Time. These shifts typically run from 12am-8am, 8am-4pm, and 4pm-12am. They hire both part-time and full-time, depending on the needs of each team. What is the Pay and When is Payday? Home Moderation Experts make between $10 to $18 an hour depending on experience. US employees start at $10 hourly. There is a lot of work as you moderate forums, delete and approve comments, and remind others of how to conduct themselves on a forum. Payday appears to be every two weeks. Comment moderation is not just about mediation, conflict-resolution, and sensitivity. It is also about good, common sense and detachment. Are You an Independent Contractor or an Employee at ICUC? 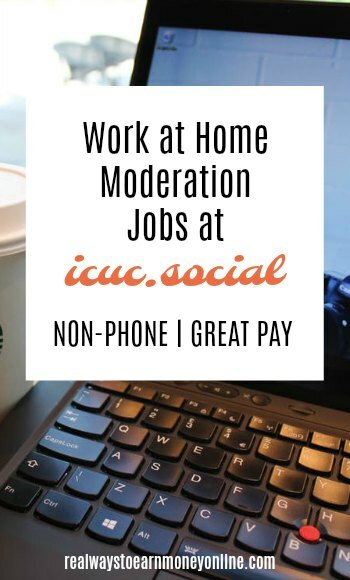 You are an employee at ICUC in the Home Moderation Expert position. They will send you the necessary paperwork to fill out. While I was looking at the careers on their website, a very helpful chat agent came on and asked if I needed help. I was able to get my question answered right away, so that should give you an indication of the level of service offered. What Skills/Special Training Do You Need to Work at ICUC? a strong communication skill set. multitasking in a fast paced environment. encouraging interactive content to achieve objectives. following any behavioral and technical issues, patterns, and trends. enforcement of the online community's safety and usage policies. monitoring activities and responses to posts on the client’s social media profiles. What is My Overall Impression of This Company? I think ICUC is a great at-home opportunity for those who enjoy forums and social media. Remember the chat agent? He/she even mentioned how much he/she enjoyed working at ICUC. If you'd like to see for yourself what other workers say about this job, Glassdoor has a ton of employee reviews. How Can an Interested Applicant Apply to the Home Moderation Expert Job? You can view and apply for all open positions on this page. Also, ICUC focuses on hiring bi/multi-lingual candidates. Please be sure to list all of the languages you can read/write in your resume! Note that even if the company doesn't have a position open at this time that is a fit for you, they may in the future, so keep tabs on their careers page. They add new jobs regularly. Looking For More Home-Based Jobs? I keep a weekly list of openings on my work from home jobs board. I also recommend trying a subscription to FlexJobs. This is a site I pay for and use myself. They post guaranteed legit flexible and/or remote job leads five days per week. It's $14.95 a month (or cheaper if you pay for more than one month), but they make it very easy to cancel if you don't find the site to be worth it. As someone stated it does say you need to know more then just english fluent wise , does anyone know if that is 100% accurate ? before wasting time filling out a hour long hiring process..
Hello, I got the chance to work in ICUC but I must say that the environment what not good. People are very cold and they treat you like if you were a machine. From 2000 comments process if you missed one they can give you warnings. Managers do not have the ability to listen moderators. They give you several pages and tasks totally different from different clients and you must keep track of every little detail. Once you start to work there you must forget about your social life, because they will pretend that you have to be available all the time for meetings, to read whatever email that comes, updates etc. You have no rights to request to be moved to a different department but at the same time you have to adjust to all their changes, you could start working 32 hours and suddenly they let you know that the client closed the task and you have to wait if something comes out. There is no stability, they are changes managers, accounts rules all the time and you can only shut your mouth and follow, you have no chances to complaint. The human resources manager is really cold and doesn’t know how to show a little empathy to the moderators she not even let you to talk at all. I do not recommend this company try others or start your own. I was going to leave a review, but I read yours and agree with everything you wrote. So I wont be redundant. You’re spot on about the management team. For one, the right hand doesnt know what the left is doing. I encountered some rude/ immature supervisors and office staff. They pull bait and switch tactics on projects and you dont have much choice in what projects you get on with or want to stay with. Over worked (responsibilities of role) for little pay in my opinion. Job should pay at least two to three dollars more per hour. Although I’ve about lost faith in some of these work at home gigs – particularly content moderation roles – there are some better options in the social media listening field. My two cents. I just applied for this job as they are currently looking for online moderators. I really pray and hope that I can get this job because it would be an amazing experience to work for them. @Tiffany – Good luck! I will keep my fingers crossed for you! I applied about a week ago via the link site you state above, but I never received an email notification of receipt of my application. Can you please advise? Hi again! Tamera with ICUC Moderation. We’re not going to be using the website that you linked to accept resumes much longer. Can you please change that and ask people to email their resume to jobs@icucmoderation.com? Also, because of the demands of our clients, we focus on hiring bi/multi-lingual candidates. Please be sure to list all of the languages you can read/write in your resume. Sure, I will update the information. Thanks for letting us know! We focus on hiring candidates with multi-language skills, and we currently work in 22 different languages. We work in 8 hour shifts based in Central Time. These shifts typically run from 12am-8am, 8am-4pm, and 4pm-12am. We hire both part-time and full-time, depending on the needs of each team. Our employees do not log in whenever they want. US employees start at $10 USD per hour. Those who are interested in advancement may be evaluated by their managers for promotions. We feel very strongly about promoting from within, especially for our “rock stars”! We are looking for candidates who have exceptional writing/blogging/English major backgrounds to ensure the high quality our clients expect is always met when we engage over their social media pages. We’ve noticed that you mention the Moderation Gateway certification course and wanted to clarify that although this course is a plus, it is not required. ICUC is in no way affiliated with Moderation Gateway. If anyone is considering applying for ICUC, we would love it if you could please mention any social media background that you have in your resumes. We work with all major social media platforms, so we definitely need to see what your qualifications are. Again, thank you so much for blogging about our company! Thanks for stopping in and providing all the additional info, Tamera! Yes, thanks so much Tamera for stopping in! Glad that you are getting awesome candidates! Good luck to all who apply! I think all our readers are pretty awesome too. @Danita, thanks! Just out of curiosity, when you emailed them back the info to their questions, did you happen to get another email right back asking the same questions? I got that, but I still think my info went through to them…at least I hope! Yes Blue I did get the email twice. Thank you Anna for posting! I just applied. Good wishes to us all who apply! I applied as well. I’m a little concerned about the moderation foundation certification the company recommends applicants to complete. I visited the website and it appears you have to pay for it. That’s a big no no for me. I wonder if that is the case? @Shon – My understand when I was researching and writing this article was that the certification was optional. It would be to your advantage to do the certification, but not necessary. Personally, a red flag for me is to pay for training. However, a certification that I could use to showcase on my website or mention on a resume, would be a plus. It could also be used to hopefully attract other similar type jobs. Again, just my two cents’ worth! Good luck, Danita! Fingers crossed for you! If you do get the job, check back and let all the readers know how you like it! Thanks for posting. Thank you Anna! I just applied with this company. I pray that I get the job. Hi Danita…can you please share if you got the got, and if so, what your experience has been like?